This morning I got into a bit of trouble with my neighbor…. For singing of all things! 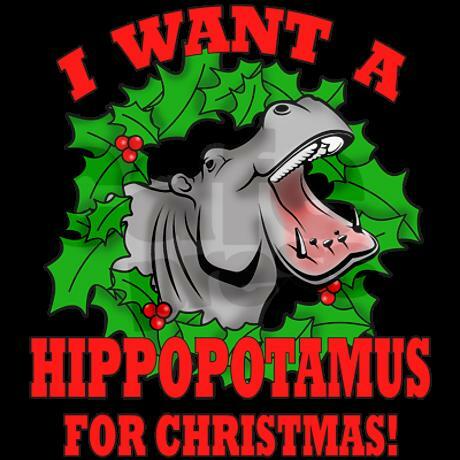 He did not appreciate being woke up to “All I want for Christmas is a Hippopotamus”..There is something to be said about opening your mouth and belting out a tune, it’s something I think we should be doing more of. Aren’t we all just beings who want naturally to be free to express? People have lost that quality and can seem to only be able to do it with a smart phone in hand. I feel totally true to myself while singing and all my senses and body feel connected. And on this note my holiday wishes for all of you are… “May you be blessed with laughter, peace, and love”. Enjoy the season living on the high notes. This entry was posted in love and poetry and tagged love, merry christmas, music, philosophy, singing. Bookmark the permalink. Wishing you a wonderful Christmas Estee!